!st Woodcutts busting at the seams! First Woodcutts has become a victim of its own success, for the first time in our history in the national census this year we have become the 2nd largest Group in East Dorset, just ponder that for a moment, bigger than Ferndown, West Moors, Verwood , Colehill and even 1st and 2nd Wimborne, we were only beaten by Corfe Mullen, since our HQ was built member numbers have nearly doubled in size so much so that recently we have had to either put young people onto a waiting list with the possibility that during their wait they may never get into the Group, or suggest that they join another Group but with other Groups being so far away it makes it difficult for transportation, these young people may never get to experience what the Scout movement has to offer, this makes me sad as Scouting has been my life and to use the current sound bite what I have achieved is Skills for Life. 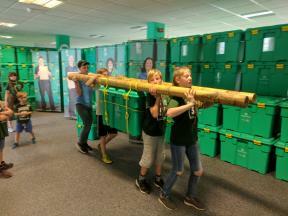 During Summer Camp 2017 the Scouts visited the Shelterbox HQ in Cornwall and learned about the work the charity undertakes supporting communities throughout the world who are hit by disasters. 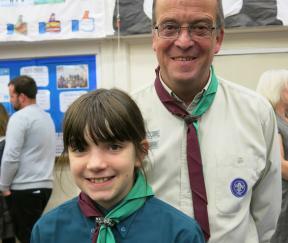 The Scouts learned about the contents of the boxes and how they were designed to support a family of up to 10 people for a year. When it came to choosing a charity for Woodcutts to support in 2018, Shelterbox was the unanimous choice. 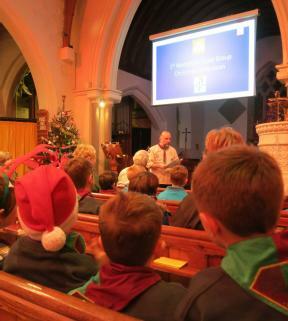 On the 12th of December, 74 members of First Woodcutts and 100 plus adults attended our Christmas Celebration Service at St Marys Sixpenny Handley. It was hosted by our New Vicar Canon Richard Hancock. The displays just get bigger and better! This year we have worked really hard to bring you the best effects possible. 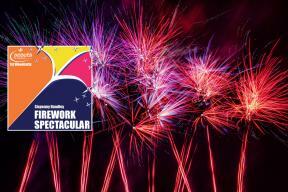 The children's display starts the evening and is a gentle introduction to fireworks, the sky will be filled with colour but the bangs are quieter. Then comes the main display! This is set to be a display to remember, so be ready to 'oohhh' and 'aahh'. 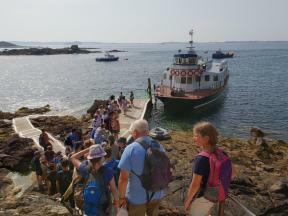 During the last week of July, 44 members of 1st Woodcutts packed their rucksacks and headed to Guernsey for a week of adventure, challenges, fun and friendship on our annual summer camp. Guernsey and Woodcutts have a long history together with many camps there over the years. As all of the young people and leaders boarded the ferry at Poole early in the morning and set sail past Brownsea, there was an anticipation it was going to be a special week, but no one could have guessed just how amazing the seven days ahead were going to be. ...and these aren't just for the boys! 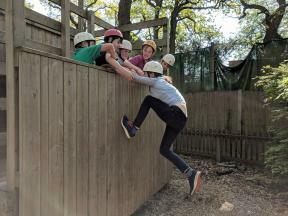 During the first May Bank Holiday, over 50 members of Woodcutts enjoyed a weekend of adventure and challenges at Butchers Coppice, near Poole. Activities included air rifles, archery, caving (in a purpose built converted bus! ), crate stacking, climbing, team challenges, tomahawk throwing, fire craft, rocket making and the usual fun and games of being on camp. The Beavers joined the camp on the Sunday and got well and truly stuck in with the activities. 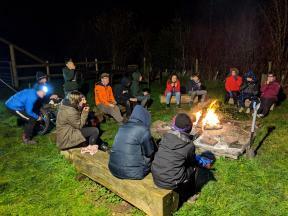 The Sunday evening finished with the whole group enjoying songs around the camp fire. The fun and joy of being on camp was best summed up by one of our Beavers, who said 'this is the best day ever and I just don't want it to end'. We will take that as a glowing endorsement of what it means to go camping with Woodcutts. 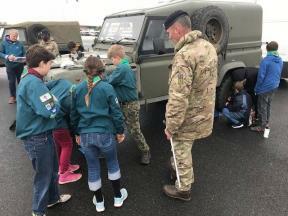 12 Scouts were invited by the Army to visit MOD Lyneham, in Wiltshire. The Scouts were the guests of the Royal Electrical and Mechanical Engineers and spent the day learning various mechanic skills, including changing a tyre on a Land Rover, welding, how an internal combustion engine works and working on Lynx helicopter! At the end of the day the Scouts were presented the Mechanics Badge by a Colonel of the regiment. Exciting news as Woodcutts Cubs achieve the top badge award in Cub Scouting!!! 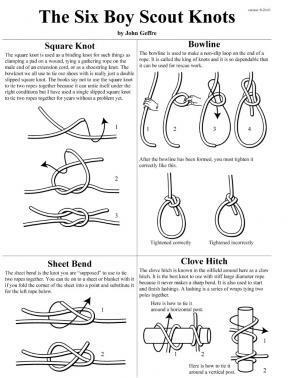 Cubs Scouts love to work toward Scout badges and we offer a wide range of different ones to choose from. Ranging from such diverse topics as Book reader, Artist, Astronomer and Hobbies through to Backwoods Cooking, Martial Arts, Equestrian and Environmental Conservation and a whole host of others in between. We also offer 7 Challenge badges – Adventure, Outdoors, Personal, Skills, Team Leader, Teamwork and World. Each one of these represents a significant amount of work and commitment during four weekly pack nights and at home!The ultimate goal for a Cub Scout is to complete all 7 Challenge badges and achieve a minimum of 6 Activity badges to be eligible to receive the Chief Scouts Silver Award.I'm delighted to be able to report that over the last six months 10 of our young people have now achieved their Silver Award with the latest two having completed last week. A brilliant achievement by all. On behalf of the Woodcutts leadership team I offer my congratulations on a job well done to the following young people -Rafferty Acton, Miriam Booth, Ned Cook, Dylan Easton, Nataleigh Goulden, Farran Moor, Ben Reach, Peter Swan, Dean Singleton, William Woodvine. After visiting the headquarters of Shelterbox during last year's Summer Camp in Cornwall, the group have decided they would like to help this good cause and have set themselves the challenge of fundraising £1200, enough to purchase 2 Shelterboxes.